Hauptbahnhof Berlin is a shopping center in Berlin Tiergarten, Germany. The opening hours are not available, yet. Ostbahnhof Berlin is a shopping center in Berlin Ostbahnhof, Germany. The opening hours are not available, yet. Angerpark is a shopping center in Berlin Allee der Kosmonauten 198, Germany. The opening hours are not available, yet. Einkaufszentrum Neue Welt is a shopping center in Berlin Hermannplatz, Germany. The opening hours are not available, yet. Hallen am Borsigturm is a shopping center in Berlin Am Borsigturm 2, Germany. The opening hours are not available, yet. Allende-Center is a shopping center in Berlin Pablo-Neruda-Straße 2, Germany. The opening hours are not available, yet. Hohenschönhauser Tor is a shopping center in Berlin Weißenseer Weg 35, Germany. The opening hours are not available, yet. Kaiser Wilhelm Passage is a shopping center in Berlin Kaiser-Wilhelm-Platz 1, Germany. The opening hours are not available, yet. Rathaus-Center Pankow is a shopping center in Berlin Breite Straße 20, Germany. The opening hours are not available, yet. Shopping in German shopping centers is fun! Not only because the same number of shops can be visited under one roof, but also because of the great product diversity of international and local products. If you are in Germany, you should visit at least one shopping center. There you can find all possible product groups. If you want new fashion, you will be pleased with many clothing shops for men and women. Some of the mod brands are aimed at specific age groups. Be sure to look at the range of the German fashion brands. Shopping centers in Germany also offer drugstores. There one should look at German cosmetic products, which are not available at home. How about a face cream or a perfume? Another highlight are also German electronics shops, where you can find not only the big brands, but also cheap and good lesser known electronics. In addition to cheap tablets, televisions, smartphones and computers, these shops also offer RC toys such as drones, cars and etc. When talking about toys, one must not forget the toy stores that are found in every shopping center in Germany. There you can also find German toys such as dolls, wooden blocks or action figures. Not to be forgotten are the German supermarkets, which occupy a large area in shopping centers and attract many customers with foodstuffs, cosmetics, electronics, household goods and more. 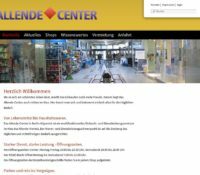 With us you will find a suitable shopping center in Germany.